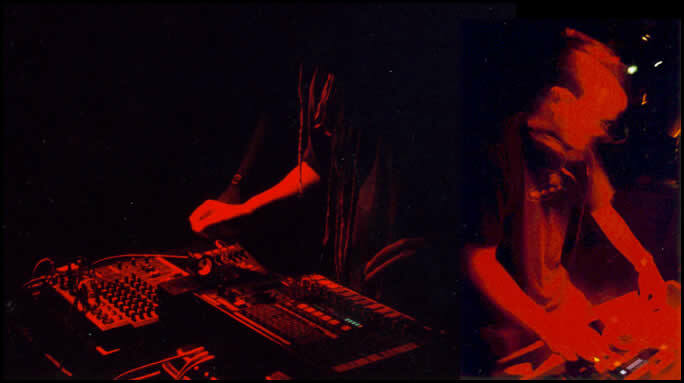 Starting out in 1991 at the onset of rave in Sydney, Sub Bass Snarl was pioneering a “decks’n’effects” setup from the beginning. Relinquishing vinyl and using CDs as early as 1992, Sub Bass Snarl have evolved into a diverse and dynamic outfit. They have performed at over 1,000 events including 5 Big Day Out festivals, Vibes On A Summer’s Day, and events from underground parties and clubs to galleries and corporate spaces. Overseas, Sub Bass Snarl has performed in Tokyo and Osaka, as well as shows in San Francisco, London and New Zealand. They have played with all the major Australian artists and have supported many of the more interesting electronic acts to tour Australia including Shackleton (UK), Surgeon (UK), Squarepusher (UK), The Bug (UK), Warrior Queen (Jam), Clark (UK), Rhythm & Sound with Tikiman (Ger), Rusko (UK), Funkstörung (Ger), Deadbeat (Ger), Coldcut (UK), Atom Heart (Ger), Meat Beat Manifesto (USA), On Un Sound (UK), David Shea (Belgium), Scanner (UK), David Toop (UK), Tom Middleton (Global Communications UK), Kodwo Eshun (UK), DJ Vadim (UK), Neotropic (UK), Anticon (USA), Hrvatski (USA), Jan Jelinek (Germany), The Gentle People (UK), Mad Professor (UK), Sutekh (USA), Nonplace Urban Field/Burnt Friedman (Germany), Tony Morley (Leaf Records UK), Si-Cut-Db (UK), Baby Ford (UK), Cylob (UK), Mike Dred (UK), Spymania Allstars (UK), Salmonella Dub (NZ), Kog Transmissions (NZ), Stinky Jim (NZ), SJD (NZ), Negusa Negust Sound System (UK), Tim Love Lee (UK), Pete Lawrence (UK), Luke Vibert (UK), Fat Cat Sound System (UK), DJ Olive (USA), Battery Operated (UK), Mitchell Akiyama (Can), Sage Francis (USA), Manitoba (UK), Kevin Blechdom (USA), Pan American (USA), DJ/Rupture (Spn), Sly & Robbie (Jam), Prefuse73 (USA). They have worked with other musicians including a cellist, a bass player and various MCs including Ozi Batla from The Herd. They are also known for their improvised film scores and have improvised new soundtracks, complete with dialogue, for The Thing, Once Upon A Time In China, Moon Warriors, Tetsuo II, Hellraiser, and other cult cinema. We currently play a mix of bass heavy sounds as you might expect from our name. Some recordings of set may be found here.